As old as our marriage is our participation in an annual farm share. Of course we're the only people in America that seem to call it a farm share. Most others refer to it as a CSA. However, Jen and Nate Participate in . . . Community Supported Agriculture didn't have quite the ring to it as a title for this ongoing experiment in futility. While it is true that the original purpose for this blog was to talk about our vegetables it has surely become taken over by our children in the last year. We've had very little complaint about this from our original three fans as it turns out most people seem to be much more enthusiastic reading the exploits of our human babies than they were in the obsessive cataloging of the number of garlic scapes we received on a weekly basis. Thus begins our most recent year's farm share. 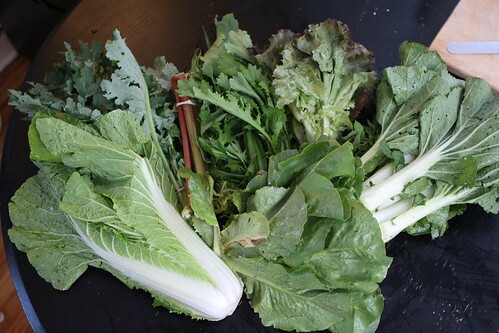 In week one we got a lot of the expected greens: bok choy, chinese cabbage, red leaf lettuce, romaine lettuce, sorrell, rhubarb, garlic chives, mustard greens, mizuna, and oregano. Jen left town this morning to head up to New Hampshire for a work trip. This left me alone to hang with the Wombats on a bachelor "weekend" of sorts. It also left me alone to deal with picking up the farm share for the first week. We opted to avoid the fruit share this year simply because it's difficult keeping up with the quanitiy of apples one gets later in the season. I did, however, sign us up for a goat cheese share when I picked up. I didn't consult Jen but hopefully when she reads this she is okay with it. And also hopefully she will mail the check to the farm to pay for it. 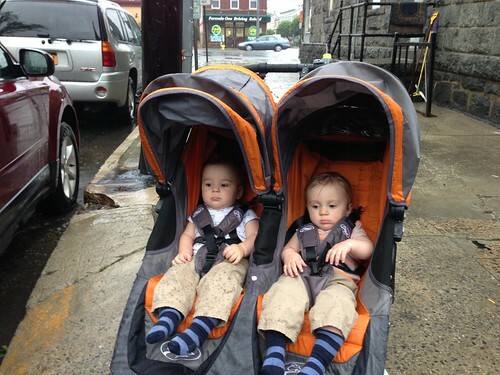 After dropping off the vegetables I headed out to pick up the guys in the cold, miserable, pouring rain. 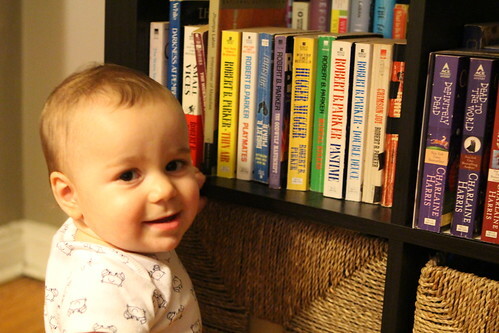 Elliott took particular interest in the works of Robert B. Parker this evening. I had a hard time prying him away from the books, especially since Martin was busy trying to open up the wine fridge. Trying, and succeeding, I should mention. At home Elliott was off like a shot. I continually had to retrieve him from his new favorite spot: the hallway. It must be the novelty of it all because there really isn't that much going on in the hallway. He just zips by all of his fun toys so that he can fiddle around with some dirty old shoes. 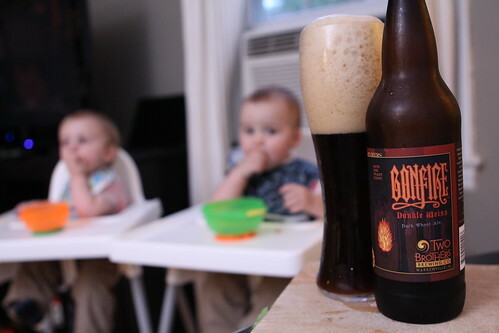 As I fed them I cracked open this Bonfire Dunkel Weiss from Two Brothers Brewing Co. This was an excellent dark wheat beer. It also goes well with baby food. Considering I didn't have time to make myself dinner I just snacked on their dinner which means I had peanut butter toast, pasta, cheese, grape tomatoes, and watermelon. All fine accompaniments for a dunkel weiss. It's also worth mentioning that the beer listed the IBUs at 15.1, the most precise IBU measurement I've ever seen on a bottle of beer. 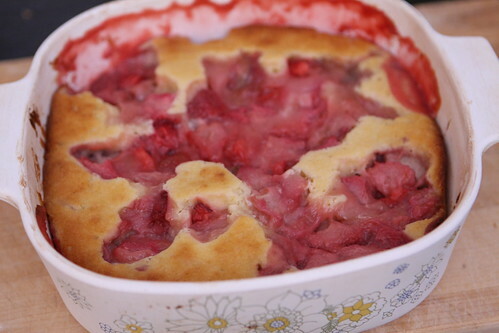 We went to the farmer's market yesterday morning before work and Jen got some rhubarb and strawberries which she used to make me this strawberry rhubarb pudding. Jen informs me that it's a pudding in the English sense, not in the American sense. I probably could have guessed that by looking at it. It was very delicious and even goes good with dunkel weiss, just like melon, pasta, and peanut butter! I'm starting to think that I just like dunkel weiss a lot. Labels: babies, Baking, beer, Farmer's Market, What'd we get?